Kimberley rock art is a complex archaeological subject and KFA has responded by developing a research program that spans key scientific disciplines. We support a broad range of scientists from the fields of archaeology, geology, palynology and related areas who work with Aboriginal communities to uncover Australia’s earliest settlement history. The KFA’s Science Advisory Council assesses each project proposal in the context of KFA’s long-term research interests and with consideration of the interests and participation of Indigenous communities, sustainable research outcomes and the wider academic discourse. KFA provides seed funding for approved ‘first stage’ research particularly if the research has potential to become an Australian Research Council (ARC) linkage project with academic partners. KFA will then consider funding ‘stage two’ to support an ARC grant application. Selected projects are anticipated to produce research results that will inform both policies and practical measures, leading to better protection and preservation of Kimberley rock art. Findings will also contribute to measures to find an optimum balance between access and conservation, which is increasingly becoming an issue. Research findings are communicated via professional journals, the media and a series of public lectures. We are currently the major funder of two current ARC projects Rock Art Dating and Kimberley Visions and two other large ARC research projects nearing completion. KFA is supporting scientists and researchers from more than ten universities and institutions. The research KFA is funding, along with recent research taking place in Sulawesi, is re-shaping ideas about human migration. It has shifted the focus of early archaeological research from traditional Western hotspots to Australia’s doorstep. Interpreting and understanding Kimberley rock art and the artist, people and cultures that produced it. 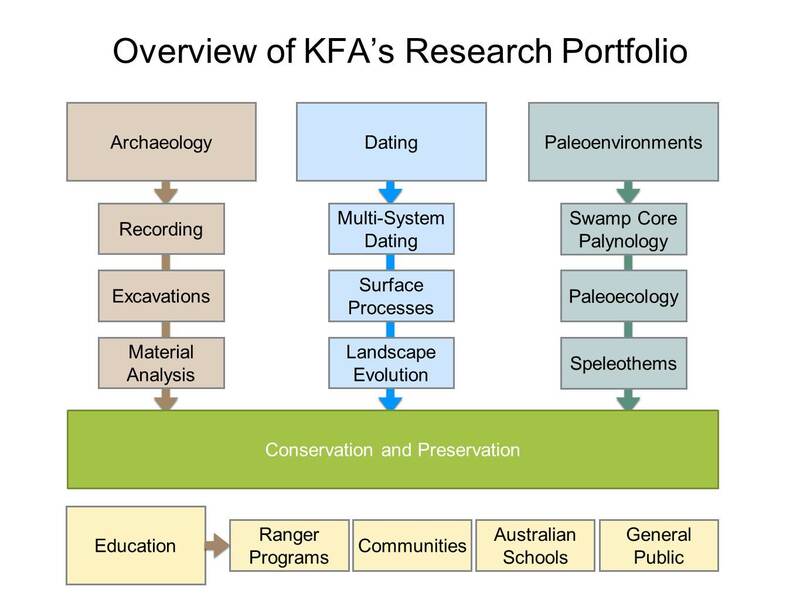 KFA’s approach in pursuing these themes, referred to scientifically as a ‘catchment type’ approach, focuses on locating research sites that are relevant across key disciplines. These include archaeological and paleontological sites and cultural landscapes. We will build on research already done expanding the depth and scope of our understanding. All research is undertaken in concert with the Prescribed Body Corporates and Indigenous Protected Area Ranger programs and industry stakeholders to ensure engagement, cultural relevance and compliance. The appropriate selection of projects is essential to ensuring our research program is well integrated. We work collaboratively and respectfully with traditional owners and their communities. Read about our cultural protocols. In selecting projects the SAC assesses each project proposal in the context of KFA’s long-term research interests, and with consideration of the interests of indigenous communities and the wider academic discourse. Selected projects are anticipated to produce research results that will inform both policies and practical measures, leading to better understanding of Australia’s earliest settlement history and better protection and preservation of Kimberley rock art. Findings will also contribute to measures to find an optimum balance between access and conservation, which is increasingly becoming an issue. Research findings are communicated via professional journals and to the wider public via KFA’s Public Lecture Series, talks and media in order to meet these goals. Wonderful art galleries, amazing mythology and a perfect experience that enhanced my appreciation of the Kimberley's significance to Australia and her pre-history.